Much like the black boxes of starships from Startrek, to keep the systems (i.e. servers) running, administrators even today rely on logs. Jokes aside, these application-generated files play a decisive role in tracking back and understanding what has happened in the past [at a given time] for the purposes of full / partial data recovery (i.e. from transaction logs), performance or strategy related analyses (e.g. from server logs) or amendments for the future (e.g. from access logs). Simply put, log files will consist of actions and events taking place within a given time range. A good log file should be as detailed as possible in order to help the administrator, who have the responsibility of maintaining the system, find the exact information needed for a certain purpose. Because of this very reason, log files are usually NOT concise and they contain loads of repetitions and loads of (mostly) redundant entries which need thorough analyses and filtering to make sense to a human. This is where Logwatch, a computer application designed for this job, comes into play. Log management is an area consisting mostly of search, log rotation / retention and reporting. 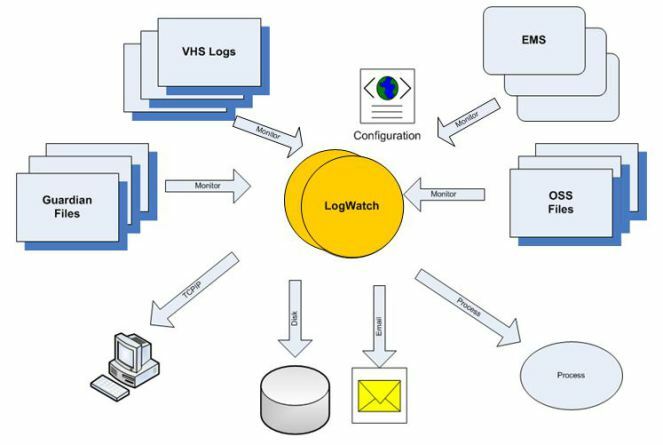 Logwatch is an application that helps with simple log management by daily analyzing and reporting a short digest from activities taking place on your machine. Reports created by Logwatch are categorised by services (i.e. applications) running on your system, which can be configured to consist of the ones you like or all of them together by modifying its relatively simple configuration file. Furthermore, Logwatch allows the creation of custom analysis scripts for specific needs. Please note: Logwatch is a harmless application which should not interfere with your current services or workload. However, as always, it is recommended that you first try it on a new system and make sure to take backups. It is very simple to have Logwatch installed on a RHEL based system (e.g. CentOS). As it is an application consisting of various Perl scripts, certain related dependencies are required. Since we are going to be using yum package manager, this will be automatically taken care of. Unless you have mailx installed already, Logwatch will download it for you during the process as well. Getting Logwatch for Debian based systems (e.g. Ubuntu) is very similar to the process explained above, apart from the differences in package managers (aptitude v. yum). Although its settings can be overridden during each run manually, in general, you will want to have Logwatch running daily, using common configuration. Upon running the command above, you will be met with a long list of variables the application uses each time it runs, whether automatically or manually. In order to begin using it, we will need to make a few changes to these defaults. Please remember in the future, you might want to come back to modify certain settings defined here. All services (applications) that are analyzed by Logwatch are listed on this file, as explained above (Configuration #5). As you install or remove applications from your virtual server, you can continue to receive reports on all of them or some of them by changing the settings here (see below*). Please note: You will need to use your arrow keys to go up or down the lines when you will be making the following changes on the document. Once you are done going through the changes (items 1 – 6), you will need to press CTRL+X and then confirm with Y to save and close. Changes will come into effect automatically the next time logwatch runs. Replace root with your email address. You might wish to replace Logwatch with your own again. You have options of receiving reports for All (all available since the beginning), Today (just today) or Yesterday (just yesterday). You can modify the reports’ detail here. Options are: Low, Medium and High. By default, Logwatch covers a really wide range of services. If you would like to see a full list, you can query the contents of the file scripts/services located at /usr/share/logwatch/. You can choose to receive reports for all services or some specific ones. If you wish to receive reports for specific ones, modify it similar to the following example, listing each service on a new line (e.g. Service = [name]). If you do not wish to have daily repots generated, you should uncomment this line. And that’s it! After making these changes, you will receive daily reports based on log files from your server automatically. To learn more about Logwatch, and creating custom services to receive reports on, you can visit its full documentation by clicking here. It should be mentioned that you have the option to run Logwatch manually whenever you need through the command line. Unless you specify an option, it will be read from the configuration file.